백자청화동정추월문 항아리는 원통형의 듬직한 몸체에 입이 크게 벌어진 병으로, 떡메처럼 생겼다 하여 속칭 ‘떡메병’이라고 부르기도 한다. 이 병은 꽃을 꽂는 화병이었던 것으로 추정되는데, 조선시대에 소수 제작되었으나 현재 전하는 예는 매우 드물다. 표면에는 발색이 좋은 청화안료로 몸통 전체에 산수화를 시원스럽게 펼쳐 그렸는데, 한 면에는 절벽 위에 세워진 누각과 깃발을 묘사하고, 그 좌측으로는 하늘의 둥근 달과 멀리 삼산봉(三山峰)을 배경으로 근경에 선유경(船遊景)과 배가 정박해 있는 강촌(江村)의 풍경을 그렸다. 이러한 소재의 산수화는 18세기 후반 경기도 광주 분원에서 제작되던 백자의 장식에 크게 유행하는데, 이 작품의 경우 그림의 필력이나 구도가 특출하여 궁중소속의 도화서 화원이 그린 것으로 추정할 수 있다. 표면에는 푸른빛이 서린 맑고 투명한 백자유약이 씌워졌는데, 이러한 유약의 빛깔은 18세기 후반 경 만들어진 백자에 나타나는 특징이기도 하다. 굽은 병의 밑바닥 안쪽을 둥글게 파내어 만든 안굽으로 접지면의 폭이 좁고 깎음새가 단정하다. 굽 안바닥까지 유약을 씌웠으며, 바닥에 가는 모래를 받쳐 번조하였다. 시원스런 형태와 빼어난 그림솜씨가 돋보이는 작품이다. This jar has a generously-sized cylindrical body with a wide mouth. Reminiscent in shape of a mallet head; hence, it is also known by its nickname tteongmebyeong, literally meaning “rice dough mallet.” The jar appears to have been used as a flower vase. Few flower vases have survived from the Joseon Dynasty, although they were manufactured albeit in moderate quantities. On the surface of the vase, an elegant landscape, painted with a cobalt pigment of an excellent blue shade, is deployed. The landscape features, on one side, a pavilion atop a rock cliff with a flag, and a full moon is visible in the sky to the left with a mountain with three peaks at a distance. Meanwhile, in the foreground, a riverside village is depicted with people enjoying boating in the river. 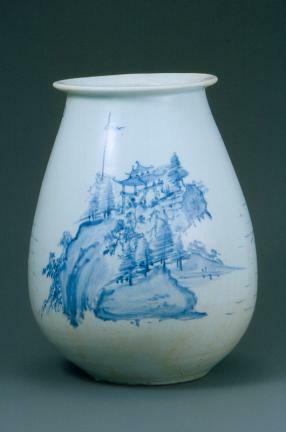 Landscapes of this type were widely popular as underglaze decorations, especially in white porcelains produced in the government kiln in Gwangju, Gyeonggi-do. In the case of this particular vase, this landscape appears to be the work of a court painter, judging from the experienced brushwork and sophisticated composition. The surface is coated with a clear white porcelain glaze with a slight blue hue. This type of translucent blue glaze is a telltale sign of late 18th century white porcelains. The foot was carved from the inside, neatly, to create a thin round rim. The foot is glazed on the inside as well. The underside shows traces of fine sand over which the vase was rested for firing. This spectacular piece of ceramic art impresses with its graceful silhouette and the beauty of the underglaze landscape.